The supraspinatus muscle runs along the top of the shoulder blade and inserts at the top of the arm, or humerus bone, and is one of the four rotator cuff muscles. A supraspinatus rupture can occur from a fall and from activities like throwing, causing an immediate, sharp shoulder pain. The treatment needed to recover from this will depend on if the rupture is partial or full. 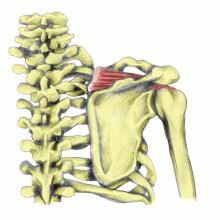 Symptoms of a supraspinatus tear include a sharp pain in the shoulder at the time of injury. There will be a pain when the arm is rotated outwards and upwards. There is likely to be an increase in pain and weakness when the arm is raised sideways between a 60-degree arc. Read more on how to diagnose a rotator cuff injury. 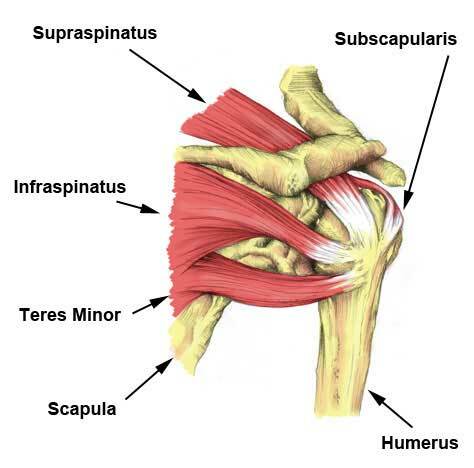 The supraspinatus muscle runs along the top of the shoulder blade and inserts at the top of the arm (humerus bone). It is one of the four rotator cuff muscles. This muscle is used to lift the arm up sideways and is also important in throwing sports as it is the muscle that holds the arm in the shoulder joint when you release what you are throwing. There are massive forces involved in slowing the arm down after you have thrown something but few people bother to train these muscles. A heavy fall onto the shoulder can also result in injuring this muscle. Injury can occur to the tendon as it inserts into the top of the shoulder on the humerus. At the time of injury apply ice. Do not apply directly to the skin but wrap in a wet tea towel to avoid ice burns. Ice can be applied for 15 minutes every 2 hours for the first day or two. From then on the frequency can be gradually reduced over a period of days. Rest until there is no pain. For a partial rupture, complete rest of the shoulder by immobilization in a sling or similar is usually recommended by a doctor. See a sports injury specialist or doctor who can advise on treatment and rehabilitation. When the injury has healed and you are pain-free rotator cuff rehabilitation exercises which include mobility, strengthening and functional or sports specific exercises should be done. If the rupture is partial, immobilize the arm and prescribe rest. Prescribe a rehabilitation program. A surgeon may operate on a total rupture. Read more on treatment and rehabilitation of rotator cuff tears.